Nothing affects a country’s economic development more than its politics. Nowhere is this clearer than in the post independent economic history of Sri Lanka. The 67 years since regaining independence were characterised by changes in economic policy in every change of government, creating uncertainty and discouraging domestic and foreign investment. Economic policy changes by themselves are not necessarily inimical to growth, but the persistent uncertainty in economic policies deterred investment as property rights were not secure and trade and fiscal policies were unfavourable for investment. Economic policies based on ideological beliefs rather than pragmatic considerations hampered economic growth. These included inward looking inefficient tariff policies, state control of business enterprises and inefficient import substitution policies. Once again, political uncertainties are casting long shadows on the economy. The current political quibbling and confusion have raised serious concerns about possible outcomes after a parliamentary election. There are serious doubts about political stability and long-run economic development. Will the outcome of the parliamentary election ensure a stable government with capability to resolve fundamental economic problems and undertake necessary economic and social reforms? With all the political jugglery that is going on, it is unlikely that any of the parties would have a clear-cut policy framework to resolve the fundamental economic problems facing the economy and spur the economy to a high trajectory of growth. The current preoccupation with political strategies to gain power leaves little space for economic issues. Ideological positions of parties lack pragmatic policies that would stimulate economic growth. Many ideological positions such as the antipathy towards privatisation of loss making state enterprises burden the public finances enormously. The political configurations are yet unclear. In all likelihood, a coalition government under President Maithripala Sirisena will be formed after the elections. Such a government with a mix of ideologies and economic interests would make consistent and pragmatic economic policies difficult to implement. In the event that no combination of parties controls a parliamentary majority, the ensuing instability and political bargaining would not be in the best interests of the economy. A stable government with an adequate majority and agreement on the policies pursued is in the best interests of the economy. Furthermore, elections in Sri Lanka often lead to extravagant election promises that further weaken the Government’s fiscal situation that is critical for the economy’s performance. Elections in Sri Lanka as Lee Kuan Yew once said are an auction of promises to catch votes. Election manifestoes make promises of benefits that the economy cannot afford. Such public spending strains public finances and increases the fiscal deficit. There is no way that this could be avoided before the elections. What is feasible is for the Government that is elected to explain the economic constraints that prevent the implementation of those promises in full so that the weak public finances are not further eroded. The presidential election in January had such extravagant promises that were a strain on the existing inadequate public finances. More imprudent expenditure is likely to be promised before the parliamentary elections and implemented by the elected government. Further concessions, wage increases and subsidies would weaken the country’s public finances. A stable government with clear-cut pragmatic policies to propel the economy is of the utmost importance. A coalition of parties that have divergent ideologies and policies could be detrimental to the economy’s long term development. 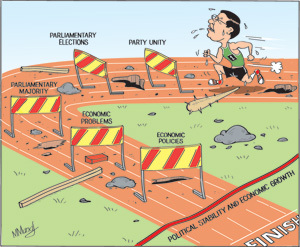 As the Ceylon Chamber of Commerce has pointed out, the current interim government has “The contradictions emerging from amongst the diverse political forces currently forming a coalition government are leading to instability”. Such contradictions within the government after the formation of the post election government could hamper economic development. The elections later this year must result in a stable government with an economic vision if the country is to achieve substantial economic development. It must be one that takes bold steps to reduce the fiscal deficit, public debt and foreign debt. It must undertake reforms of state-owned enterprises that are incurring large losses and, where feasible, cut the losses to society by selling them off to the private sector. Educational reforms that enable the country to compete internationally are imperative. The health system must be improved to serve the poor more effectively. And economic policies must encourage savings and investment to drive the growth momentum. All these are mammoth tasks that require a government committed to the long term development of the country rather than short term political gains. Will the current political developments lead to the election of a stable government that will have the will and capacity to implement pragmatic economic policies for the long run economic development of the country?